SafeIT File Shredding removes selected files. SafeIT File Shredding removes selected files permanently. 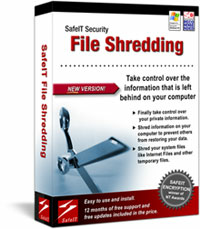 SafeIT File Shredding is an application for permanently removing (shred) files and folders from your computer. The certified and awarded application allows you to completely remove selected information on your hard drive and other memories. SafeIT File Shredding is an application for permanently removing (shred) files and folders from your computer. The software allows you to completely erase selected information on your hard drive and other memories. The product supports shredding of individual files, recycle bin, temporary files, unused disk space (free disk space) and Internet history. When you delete a file, empty your Recycle Bin or even format your hard disk, the information is NOT removed from your computer. These commands only alter the structure of the drive, leaving most of the data intact and recoverable with software tools easily available. This means that someone else can recreate the files that you think you have already deleted. The only true way to permanently remove unwanted files and data is to use file shredding software. File shredding utilizes an advanced algorithm technique of overwriting your files multiple times so that the information contained in them is no longer readable, thus destroying the original data forever. SafeIT File Shredding currently supports 11 different algorithms ranging from 1 run up to 35 overwritting runs. This includes HMG Infosec Standard 5 (Baseline and Enhanced), DOD 5220.22-M and Peter Gutmann's algorithm.